New Rochelle, NY, August 28, 2017–New biologic drugs, such as monoclonal antibodies and immunotherapies in clinical development, designed to target metastatic colorectal cancer (CRC) and stimulate the immune system to destroy tumor cells are a significant advance in treatment over conventional chemotherapy. 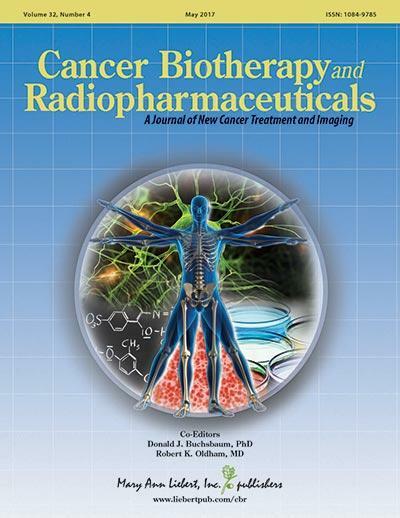 A comprehensive overview of novel approaches to combating CRC, the fourth most common type of tumor worldwide that has already metastasized when diagnosed in more than 50% of patients, is presented in Cancer Biotherapy and Radiopharmaceuticals, a peer-reviewed journal from Mary Ann Liebert, Inc., publishers. The article is available free on the Cancer Biotherapy and Radiopharmaceuticals website until September 28, 2017. In the article entitled "Molecular Targeted Drugs and Treatment of Colorectal Cancer: Recent Progress and Future Perspectives," Fang Geng, Zheng Wang, Hang Yin, Junxian Yu, and Banwei Cao, Beijing Friendship Hospital, Capital Medical University, Beijing, China, provide insights into the new biological agents approved by the U.S. Food and Drug Administration for metastatic CRC and their ability to extend patients' medical overall survival. The authors also present a detailed examination of investigational drugs currently in clinical trials, including immunotherapeutic agents such as monoclonal antibodies targeting PD-1/PD-L1, which have been approved to treat other types of cancer. The discussion on future directions and prospects for novel therapeutic strategies includes topics such as the promise of combination therapies, and approaches to overcoming drug resistance. "This review highlights the significant progress that is being made with targeted biological agents alone, and in combination with chemotherapy, for the treatment of metastatic colorectal cancer, including the use of immunotherapy. It is a valuable resource for current research in this area," says Cancer Biotherapy and Radiopharmaceuticals Co-Editor-in-Chief Donald J. Buchsbaum, PhD, Department of Radiation Oncology, Division of Radiation Biology, University of Alabama at Birmingham. Cancer Biotherapy and Radiopharmaceuticals, published 10 times per online with open access options and in print, is under the editorial leadership of Co-Editors-in-Chief Donald J. Buchsbaum, PhD, Department of Radiation Oncology, Division of Radiation Biology, University of Alabama at Birmingham, and Robert K. Oldham, MD, CAMC-Teay's Valley Cancer Center. Cancer Biotherapy and Radiopharmaceuticals is the only journal with a specific focus on cancer biotherapy, including monoclonal antibodies, cytokine therapy, cancer gene therapy, cell-based therapies, and other forms of immunotherapy. The Journal includes extensive reporting on advancements in radioimmunotherapy and the use of radiopharmaceuticals and radiolabeled peptides for the development of new cancer treatments. Tables of content and a sample issue may be viewed on the Cancer Biotherapy and Radiopharmaceuticals website. Mary Ann Liebert, Inc., publishers is a privately held, fully integrated media company known for establishing authoritative peer-reviewed journals in many promising areas of science and biomedical research, including Journal of Interferon & Cytokine Research, Human Gene Therapy, and Stem Cells and Development. Its biotechnology trade magazine, GEN (Genetic Engineering & Biotechnology News), was the first in its field and is today the industry's most widely read publication worldwide. A complete list of the firm's 80 journals, books, and newsmagazines is available on the Mary Ann Liebert, Inc., publishers website.